tulare – It’s been a year since Tulare Regional Medical Center shuttered its doors. Many thought they would never reopen. But, on Oct. 15 they did, due to a lot of hard work by a lot of people who were recognized during its morning ribbon cutting. Last year, the ailing hospital had terminated its agreement with previous hospital administration, Healthcare Conglomerate Association, having fallen into a legal and financial dispute with HCCA, which resulted in a decision to file for Chapter 9 bankruptcy protection. Through tentative approval in early August, the Tulare Local Health Care District board members voted 5-0 to lease the hospital facility to Adventist Health. The terms are a five-year lease of the 112-bed acute care hospital with renewal options, in five-year increments, for up to 30 years. Adventist Health is allowed to operate independently of the healthcare district. Adventist Health also issued a $10 million credit line to TLHCD. The catch, however, is if it will remain open which is in the hands of the healthcare district voters. Measure H allows voters to decide whether the lease can be formally signed. On the November 6 ballot, the measure must pass with a simple majority of at least 50 percent plus one. If the ballot measure is rejected, the hospital would close again by November 30, with no obligation held by Adventist Health – something no one from TRMC or Adventist Health wants to happen. For the grand re-opening, hundreds of community members showed up to honor the day. “The sun is shining, it’s a beautiful day all around,” Stephen Harrell, TLHCD board member for District 1, told the Sun-Gazette. “It’s a historic moment,” said Mike Jamaica, TLHCD board member from District 2. “There’s never been a hospital that has surrendered its license, and come back to open again,” according to one member of TLHCD bankruptcy counsel, Jamaica added. “We’re celebrating a miracle,” said Kevin Northcraft, TLHCD board president. Northcraft noted the board’s work is not done. TLHCD owns several other buildings and entities such as Evolutions Fitness and Wellness Center, which it will continue to manage. The bankruptcy issue still needs to be dealt with. And, there is the half-finished, currently unusable hospital tower, which needs to be addressed. “We started this project 110 days ago today,” said Randy Dodd, interim executive officer of Adventist Health Tulare, to the opening day audience. “That’s when the [TLHCD] board approved Adventist Health. A lot of work had to be done. Normally, tentative agreements like this might take six months. It was 21 working days. “The clock was ticking both on license and on financial resources. So, we had a list of projects and a list of additional things, and we just started working on each of those every day. During the opening remarks, the first patient was being seen in the reopened hospital’s emergency room. An announcement of this brought cheers to the crowd. More patients were seen during the rest of the day. Tulare’s mayor, David Macedo, told the Sun-Gazette he is very pleased with the reopening of the hospital. Having accessible health care is vitally important, he said, without the additional time of driving into Visalia. But, it also means more for the city itself. The three key things new business development looks at within a city are public safety, the schools, and the condition and efficiency of the hospital, he said. 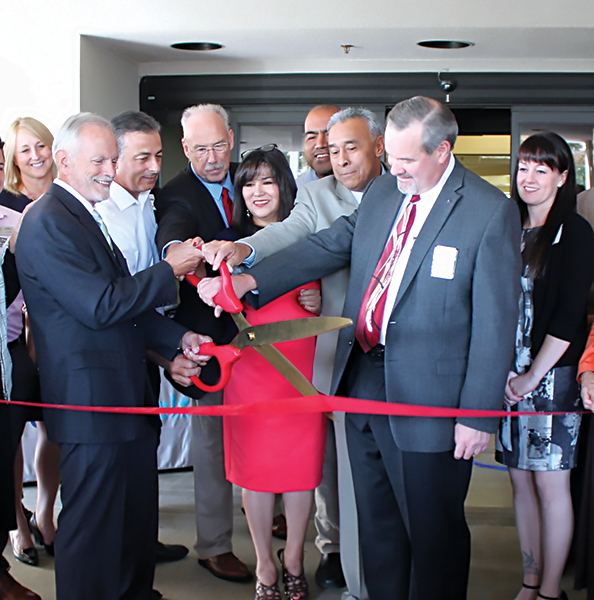 The re-opening of the hospital takes a load off of Kaweah Delta Medical Center, which had taken on the bulk of TLHCD emergency room and hospital patients for the last year. “As many of you know, Tulare Regional Medical Center is expected to open on Monday. Nobody could be more excited for them,” said Kaweah Delta Healthcare District CEO Gary Herbst, in a statement released to the press. “We have rooted for them to reopen and when asked, we have provided support and guidance along the way. There is no question their reopening will help us, however, the impact on us remains to be seen. It will really depend on the scope and nature of the services they reopen with and launch in the upcoming months. The services TRMC opened with include emergency room care, inpatient nursing, ICU, anesthesia, medical imaging, lab, and nutritional services, among others, according to a press release from Adventist Health. Other services, such as obstetrics, pediatrics, a neonatal intensive care unit and a cardiac catheterization lab, will open as staffing is completed.